Granting companions the power to self-administer stimpaks, even when they've gone into bleedout and are dying. IT'S HERE! Support for custom and multiple companion mods! "So what's the angle here? ", Piper asked, notepad in hand, staring at the titanic mountain of claw and scale that was rushing up the hill towards her. "Uh.. Blue? I don't think he's happy." And then WHAM: with one heavy swipe, the Deathclaw smacked Piper off her feet and against the rusted wall of a nearby abandoned trailer, sending her into a land of purple lights and double images. Blue checked her own ammo and mentally tallied stimpaks as the Claw slowly turned its head in her direction. Piper was alive. That was the important thing. Blue could see her gradually coming to her senses, fumbling for a stim of her own. Meanwhile, the monster had lost interest in its crumpled foe, and was now moving towards Blue. Blue would need to keep its attention long enough for Piper to get to safety. Blue checked her ammo again. Six .45 rounds. Sigh. This would take some doing. REQUIREMENTS: Nothing but the base game. F4SE/MCM if you want MCM support. COMPATIBILITY: No compatibility problems that I'm aware of. INSTALLATION: Unroll the RAR in your Data directory. Make sure the scripts land in the Scripts subdirectory. Activate the ESP. UNINSTALLATION: Pull the ESP from your load order. Remove the scripts at your leisure. Traveling the Commonwealth, it's frustrating to no end to be locked in a mortal battle against the invincible forces of atomic darkness, only for Piper to go down YET AGAIN and force you to backtrack with a Stimpak. Really, Piper. You know I got nothing but love for you. But can't I just give you a few Stimpaks to sort this out for yourself? With this mod, you now completely customize the companion bleedout/recovery process to suit your tastes. As of v1.32, this mod no longer requires Survival mode. It should work the same at any difficulty. * When companions drop below 50% health (level configurable in MCM), they will use a Stimpak from their own inventory to heal automatically. Includes an animation of the companion stabbing themselves in the shoulder with the Stimpak. * When companions reach "downed" (i.e. bleedout) state, they will use a Stimpak from their inventory to recover. If they don't have any stims, normal bleedout recovery rules apply. * Support for ALL and ANY companions. As of v1.4, the recovery script is applied dynamically to any NPC in your presence who belongs to the CurrentCompanionFaction faction. This includes vanilla and DLC companions, robots, modded, all of them. * Support for multiple companion mods. As of v1.4, this script should now support any number of simultaneous companions without any problems. * Support for all difficulties. Companion Heal Thyself no longer requires Survival mode. You can use it at any difficulty. * Full MCM support. Virtually every element of this mod can now be customized to taste. * Dogmeat (and other dog) support. Any canine companion, vanilla or modded, can be supported either as a normal autostimming companion, or with the use of an optional Red Bandana of Stimming. * No overwriting of any base records or assets. So risk of conflicts should be virtually nonexistent. Companions have a general healing rate that thus far has defied my every attempt to find and kill it. So left alone, an injured companion will soon restore to full health on their own. The problem is that in some situations, it still doesn't happen quickly enough. With CHT, companions with health below a certain point (50% by default) and some Stimpaks in their inventory will give themselves a quick jab and an HP boost. Sometimes this can make the difference in a tough fight. As this can lead to a waste of good Stimpaks, v1.3 includes MCM settings for adjusting the quick stim HP threshold, as well as an option for holding some Stimpaks in reserve. By default, companions will no longer quick stim if they have 5 or fewer Stimpaks, saving them for bleedout situations. Robotic companions are healed using the Robot Repair Kit introduced in the Automation DLC. This includes any robot or Gen 1 or 2 Synth. All other self-stimming followers use standard Stimpaks. (Note: Before anyone makes the case about Curie and X6-88, the game internally considers Gen 3 Synths to be human beings. Good enough for Bethesda, good enough for me.) This can also be configured in MCM. "Bleedout" is the state in which the companion has taken heavy damage, and is now collapsed on the ground, waiting for your help. In non-Survival modes, they remain down until you either heal them or until combat ends. In Survival mode, you must heal them. If you leave the area without doing so, they return to their currently assigned home base. With CHT installed, companions respond to bleedout by attempting to revive themselves. If they have Stimpaks in their inventory, after a short period of time they will inject themselves and get back to their feet. If combat is still happening, they will get back into battle. If they go into bleedout and have no stimpaks on them, they'll go into normal bleedout behavior. None of the code fires unless they have stimpaks in their inventory. My intent for this mod was NOT to make it a cheat. However, an automatic self-healing companion poses a problem: you could now easily just load them with 100 stimpaks and a minigun, and then kick back with a Nuka Cola while they do all the work in bad situations. * Adjusts the companion's health after recovery to about 10% of their base health. If you are using the Companion Status HUD mod, you'll see their health zoom up to full and then drop down to the lower level. They will then wait for a very brief period, heal a bit, and then Stimpak themselves again if they are under 50% health. During this period, they are on normal alert and vulnerable to attack. In my own tests, I've found that this adds a fun new dynamic to companion combat: the need to provide covering fire while your partner patches up. If you do not do this, they will likely continue to desperately attempt to recover, until they use their last Stimpak and must be rescued. Configurable via MCM, a "stun" occurs randomly when a companion otherwise would enter bleedout state. Stunned companions will not attempt to stim themselves, but rather will recover naturally after a certain amount of time. You can also optionally set them (via MCM) to not recover until the player exits combat. Likewise, if stun odds are set to 100%, vanilla companions will recover from all bleedouts without stims. Stunned companions can still be recovered by the player with a Stimpak. Stun odds (default: 25%, but can be adjusted to 0-100%), stun recover time and post-stun health recovery can all be customized in MCM. Note: For stunning to work, companion bleedout recovery must be set to ON in the "General Settings" MCM panel. At long last, Dogmeat gets some CHT love. Pre-1.3 versions of CHT did not include support for Dogmeat. Doing it was a simple technical matter - the problem was realism, as I couldn't rationalize giving auto-stim powers to a character who physically couldn't wield a Stimpak. As of v1.3, Dogmeat support is included via MCM. Switching the "Armor Keyword" setting to ON ties Dogmeat's new autostimming talents to his "Red Bandana of Stimming", which is also placed in the player's inventory via the MCM panel. In this mode, Dogmeat will only autostim when he's wearing the Red Bandana. If "Armor Keyword" is set to OFF, Dogmeat will act like any other companion, autostimming per the "General Settings" parameters. If you want Dogmeat to simply have magic stim powers, leave "Armor Keyword" to OFF. If you want Dogmeat to continue without autostim powers of any kind, set this to ON and then don't equip the Bandana. Companion Heal Thyself now has full MCM support. This opens up a few options that weren't available before. Note: these settings apply to all companions. At this time there is no way to customize MCM settings on a per-companion basis. * Enable/disable companion bleedout recovery. If set to OFF, companions will not attempt to autostim themselves out of bleedout state. * Enable/disable companion quick-stimming. If set to OFF, companions will not attempt to use Stimpaks to boost low HP. * Post-bleedout HP restoration. When a companion recovers from bleedout, their HP will be restored to this percentage of their base health. * Maximum delay before recovery. When a companion is in bleedout, this is the maximum time delay (random) to occur before they attempt to recover. * Health threshold for quick-stimming. If quick-stim is ON, companions will use a Stimpak whenever their health drops below this percentage level. * Stimpaks held in reserve. If a companion has fewer than this many Stimpaks, they will not quick-stim, saving them instead for bleedout recovery. * Odds of companion stun. Random chance that any given companion bleedout event will instead become a stun. * Maximum delay before stun recovery. When a companion is stunned, this is the maximum time delay (random) to occur before they recover. * Post-stun HP restoration. When a stunned companion recovers, their HP will be restored to this percentage of their base health. * Wait for end of combat before stun recovery? If set to ON, stunned companions will not recover until the player is no longer in combat. Any questions about the MCM settings, feel free to ask in the comments section. Installation is a simple matter of unarchiving the RAR into your Data directory, and activating the ESP. There is no longer any DLC requirement of any kind - the script will autodetect DLC presence and configure itself accordingly. Only the base game is required. To uninstall, deactivate the ESP and remove the scripts at your leisure. This mod does not touch any base scripts, so it should be as simple as that. Script source code is included in main RAR. To the best of my knowledge, no significant ones. It should work out of the box with no trouble. 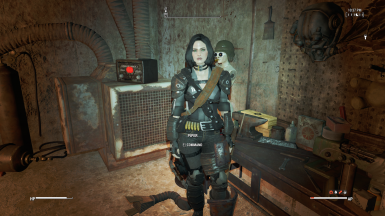 I use several companion mods such as Valentine Reborn, Tough and Deadly Bombshell Piper, Companion Radio, and others with no conflicts or problems. I also strongly recommend using a mod that severely limits the availability of stimpaks (I wrote my own, but there are several floating around the Nexus if you're so inclined). In addition, I have redesigned Companion Heal Thyself to work well with my combat AI mod, Pack Attack NPC Edition. As of v1.4, this mod now autodetects the presence of any current companions belonging to the CurrentCompanionFaction faction. Nothing further is necessary to support custom companions. It should just work. Always appreciated, never required. I do this stuff because I'm a hopeless Fallout addict, have been for a long time, and like pulling out the wires to see what sparks. Donations via Nexus are awesome and will result in a note of generous thanks. Thanks to all those who have taken the leap of faith to try this mod, commented, and/or endorsed. Thanks also to all FO4 players willing to be flexible about how they play their games. Thanks to Piper Wright, who has courageously suffered hundreds of direct gunshots to the face from her best friend Blue, and has done so without complaint - not that she remembers them later, of course. Thanks to track1044 for pointing out how to do this with minimal mod conflict risks. And thanks to Bethesda for the game itself. These games aren't always what everyone wants all the time, but Bethesda does a great job providing the tools to make their games everything an individual player may want them to be. FO4 is no exception. CBBE (because, of course) - http://www.nexusmods.com/fallout4/mods/15/? Tough and Deadly Bombshell Piper - http://www.nexusmods.com/fallout4/mods/9250/? Vault Explorer Suit (undersuit, in black) - http://www.nexusmods.com/fallout4/mods/16887/? Wearable Backpacks and Pouches - http://www.nexusmods.com/fallout4/mods/3258/? Lore Friendly Backpacks (Postman Bag) - http://www.nexusmods.com/fallout4/mods/21506/? Colt 6520 10mm Revolver (preferred sidearm) - http://www.nexusmods.com/fallout4/mods/16129/? Synth Overhaul (tough black armor pieces, won in combat) - http://www.nexusmods.com/fallout4/mods/9525/? Real Leather HD (shiny leather armor pieces) - http://www.nexusmods.com/fallout4/mods/7797/? Passive Aggressive Piper (my own mod) - http://www.nexusmods.com/fallout4/mods/22585/? Basement Living (in background) - http://www.nexusmods.com/fallout4/mods/10967/? "Cat-Mod takes care of the cats of the end time"